Home / Personal Finance / How To Invest Your Savings Healthily? 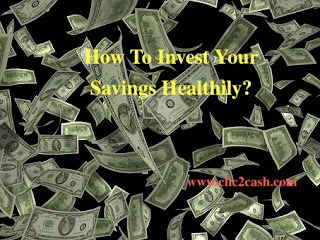 How To Invest Your Savings Healthily? One of the most common questions that people will think of, and therefore will present to a financial planner, is how to invest their savings? The goal of investing savings for most people, is going beyond simply having a safe place to park their money. Most people understand that if they simply need a place to park their money, there are a variety of savings accounts that can be obtained from one’s bank. However, most savings accounts at the bank pay out such a poor return on investment, that it’s almost not worth it, beyond one’s day to day expenses, to invest one’s money in a simple bank savings account. What most investors want, is a vehicle to not only park their savings, but to also grow their savings. This is why they should think about a variety of savings investment strategies. They will need to think about dividing their money into short term savings, and into long term savings. Long term savings are for goals such as one’s retirement fund, and future health care expenses.These two issues go hand in hand. When a person retires, they aren’t earning money anymore. They will need money to live off of, so that they can enjoy their retirement years in a dignified fashion. The retirement years are often when a person incurs the most health care expenses. As such, a person will need to save aggressively for these years. To this end, a person should invests up to 80 percent of their savings into long term investment vehicles. They should think about investing with mutual funds, with a diversified portfolio. An investor should diversify, because the diversity of healthy performing investments will help to offset poor performing investments. The investor should also make sure that they investing with a fund manager that charges a low fee. The point to to grow one’s own retirement funds, and not the fund manager’s retirement fund! They should take up to 20 percent of their savings, and invest these into short term vehicles, such as a money market fund. These investments would be more appropriate for growing an emergency fund that could be called upon within a few years.